His father shoots himself, and all he's left with is the old cattle dog and a vague desire for explanation. He loves swimming so he drifts south to Garopaba, a quiet little town on the Brazilian coast, where his grandfather disappeared in mysterious, possibly brutal, circumstances decades before. There, in the midst of romantic flings and occasional trips, he comes to discover more than he could ever have imagined - not just about his grandfather, but also about himself. You'll be happy here. Everyone's happy here. This place is so beautiful. I'm really happy here. Can I smoke a joint in your car? Ninety percent of the world's evil is the rich guy paying for the poor guy to do it, he says. 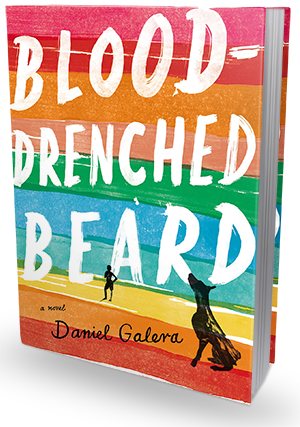 Blood-Drenched Beard is a very demanding read. I found many aspects of it intriguing and very well executed, but could not, ultimately, connect with the story or the lead character on a deeper level. Additionally, I thought the writing was slightly too.. quirky. To the point of being obnoxious and, as consequence, preventing the plot line from moving along and keeping me captivated. The long descriptions and anecdote-filled plot make it a very slow-moving story, and the fact that the dialogues aren't clearly marked (no quotation marks) certainly doesn't help move things along, but overall, this is a carefully and purposely crafted, somewhat elusive noir fiction full of existential themes and grittiness. My guess is - and I could be completely wrong - that this book lost quite a lot of its soul and substance in translation, and what remains is a bit too confusing and foreign for me to fully enjoy. There's something exotic about this book for sure. Th atmosphere is humid and hot, the plot line drags along at a very lazy, intoxicating pace and you will either love that about this book, delight in its edginess and unique charm, or you will find yourself lost and confused. Sadly, I belong to the latter group of readers. This isn't a short book - at 400 pages long printed in a really tiny font, it's quite a challenging and energy-consuming read. However, for such a long novel, not much happens at all. The action twists are few and far between and it's more of a book about everything and nothing in particular, following a vaguely sketched theme of uncovering the truth behind a relative's mysterious death. Perhaps this just wasn't a book for me. Perhaps I'm not familiar enough with the Brazilian culture to be able to fully appreciate it. Perhaps I'm not sophisticated enough to really enjoy it. The fact is, I was bored for most of the book, felt no real connection to the story and the characters, and was slightly annoyed by the ginormous, few-page-long footnotes filled with, well, nonsense. Whatever the reason, I did not like Blood-Drenched Beard. I hope you'll have much better luck with it!